Tip: When cutting and installing a new set of wires, mark each end at the boots with its designated cylinder number. This will serve as a great quick reference in the future. Here’s what you’ll net: more reliable spark delivery to the plugs and a cleaner looking engine compartment: set of quality spark plug wires (boots and terminals included), white dielectric grease, wire socks (recommended), wire looms. To determine the correct length for each cylinder, install the wire on the spark plug and mark the other end at the cap. After the insulation has been stripped away, fold the conductor wire back and slide it into the connector to be crimped. Be sure to apply plenty of grease to the connector before inserting it into the boot. Spark plug wires play an important part in the secondary ignition system. They deliver the voltage of the coil from the distributor cap terminals to the spark plugs. On systems with an external coil, there is also a small patch wire running from the coil to the distributor cap. Heat is the number one enemy when it comes to plug wires. Forced to withstand extreme engine and air temperatures, a plug wire is only as good as its insulation. Most aftermarket companies today use heat-resistant silicon for the wire’s outer insulation. In serious race applications, a second inner layer of silicon is used as well. If the insulation of any wire looks faulty or heat damaged, replace it. Replace them all. A faulty wire will derail the voltage from the distributor and cause it to either ground or possibly jump to another nearby wire, thus creating a misfire. This is why it’s important to use some form of wire looms and/or rigid retainers when routing a new set of wires. Doing so will keep the wires off of the exhaust manifolds or headers, and will maintain separation for each individual wire, too. Now, let’s get down to making cut to fit plug wires. Depending on the type and purpose of your motor, the first thing to do is select the right wire for the application. The popular favorite, and by far the most common is the 8mm resistance wire. Every ignition company under the sun offers a variety of sizes and colors to fit standard or HEI-type terminals. Straight or 90-degree boots on the other end is also a factor to consider. Although you may be able to purchase precut wires to fit your specific motor, many times they are not 100% accurate and can be more hassle to fit than bargained for. The easiest way to ensure the right fit and look is to tackle the job yourself. Before getting started, you’ll need to know the firing order of the motor. Whether you remove the wires one at a time or all at once, the location of the wire on the cap is crucial to cutting the correct length. With the distributor free and clear of the plug wires, install the new wires on the spark plugs. Most cut-to-fit wire sets come with the spark plug boot already installed on the wire, and have plenty of extra length to allow for different routing options. You can now mock each wire up to its destination on the cap and make your mark. Using a pair of wire cutters, snip the wire and strip approximately ½” of the insulation back with a razor blade. Take it down to where only the conductor wire remains and pin it against the outer insulation layer (see photo 2). Your kit should include standard and HEI-type connectors and boots. Position the wire into the proper connector with the inner conductor wire at the top. Firmly crimp the connector body over the wire to secure the conductor to the metal body. 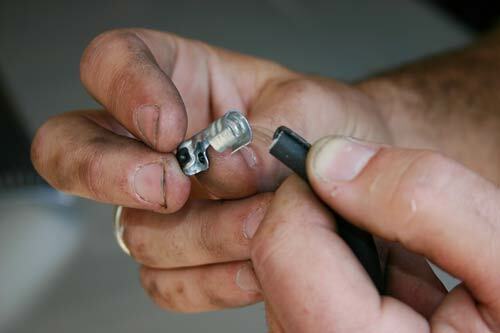 With the help of a little dielectric grease, slide the connector into the boot (see photo 3). Take your time and repeat the process for the remaining cylinders. Your wires will be clean, nicely tucked away, and safe from the harmful mishaps of life in the engine compartment.